Nature Kenya’s strength is based on its membership. An informed and committed membership makes Nature Kenya’s voice be heard by those who need to make conservations decisions. Membership fees meet the cost of servicing the members and any surplus contributes to conservation objectives. Currently Nature Kenya has some 1,000 active members and seeks to grow its base of members and supporters as a constituency for conservation action. Nature Kenya recognizes that in order to want to conserve, we must first understand and appreciate. We seek to improve public awareness by availing scientific and technical information and informing members and the public about issues impacting on biodiversity, and the value of biodiversity to our everyday lives. Holding public exhibitions – visit us at the Nairobi International Trade Fair! Organizing and supporting conservation campaigns, such as Save the Taita Apalis appeal, Save African Vultures campaign, ‘Lungs for Kenya’ initiative. Since February 1971, the Wednesday Morning Birdwalks have met at the National Museums of Kenya in Nairobi at 8:45 am, shared transport, and visited the green spaces of the city. The Sunday Birdwatch on the third Sunday each month was added a few years later. Started by Fleur Ng’weno as a volunteer, the birdwalks are now a part of the Nature Kenya calendar. Fleur still leads most of the walks, with help over the years from June Dirks, Pat Wootton, Nina Mudida, Damaris Rotich, Dorrie Brass, Shailesh Patel and currently from Peter Mureithi, Charles Mwangi, Norman Kiboi and Martin Omaya. Birds seen and heard are recorded by other volunteers, and the information entered on Kenya Bird Map [FN3] and other databases. 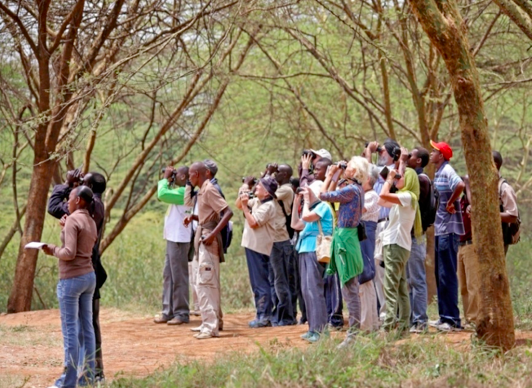 The birdwalks are a membership benefit for Nature Kenya members, who take part free of charge. Participants help one another by finding the birds, sharing transport and books, keeping lists, and taking photos for detailed identification. Thanks to Peter Usher for generously sharing his many photos! What has kept the birdwalks going over 45 years? Nairobi has a wide variety of parks, gardens, forests and open spaces. The birdwalks are held without fail, every week, rain, shine or traffic gridlock. Most important, Fleur still enjoys seeing the birdlife of Nairobi, and takes interest in the most common of birds. With its more than 600 species of birds, and at least five regular bird outings every month, Nairobi is truly the world’s birding capital! 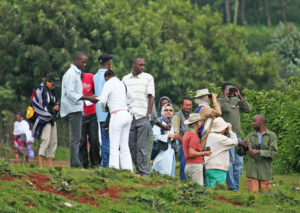 The Wednesday Morning Birdwalks are a benefit for members of Nature Kenya – Africa’s oldest environmental society. You may join a birdwalk by taking temporary membership for the morning. Nature Kenya is based at the National Museums of Kenya in Nairobi and is open weekdays from 8am to 5pm. Through the Wednesday birdwalk many guides have gained practical experience on birding. 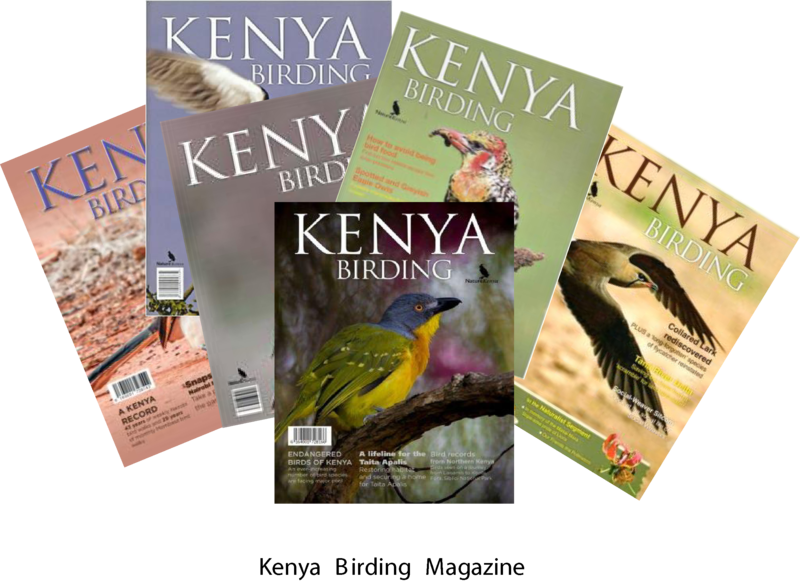 In-house publications – monthly Nature Net newsletter, annual Kenya Birding magazine, Kenya’s IBAs Status and Trends Report, scientific journals Scopus and Journal of East African Natural History and informational posters, banners, brochures and flyers. Nature Kenya’s social media platforms – Twitter (@Nature_Kenya), Facebook (Nature-Kenya) and Youtube. Media articles and radio and television broadcasts – interviews, news items, documentaries. 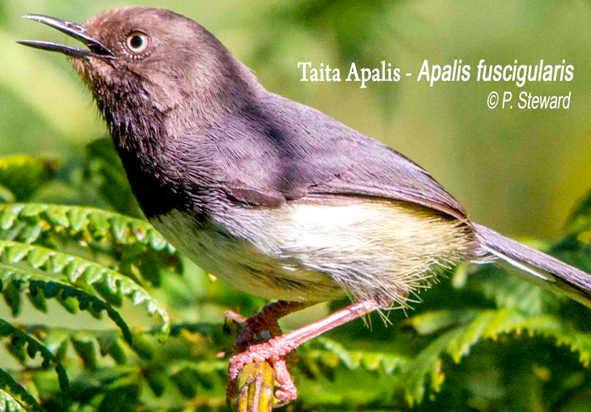 The Taita Apalis (Apalis fuscigularis) is one of the rarest birds in the world.